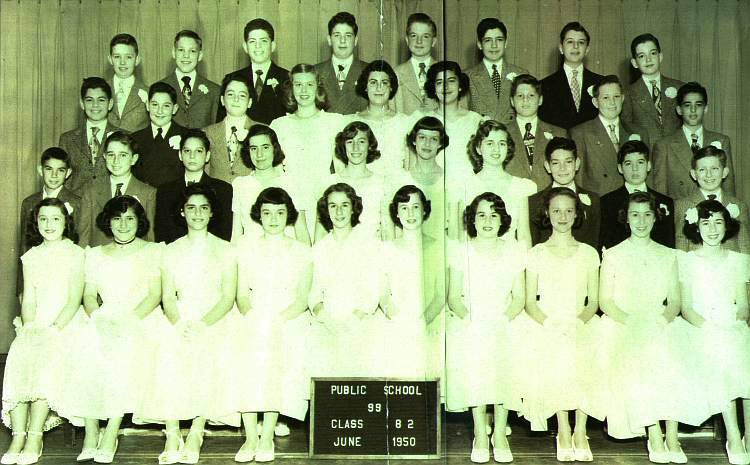 A Picture History of Kew Gardens, NY - Class Pictures - PS99 Graduating Class 1950. First Row (l-r): Dorianne Kurz, ?, Ruth Abenheim, Dvora Granet, Sally Goldsmith, Fredrika Martel, Eva Schwarz, Claudia Brunschwig, Laura Glarden, Miriam Wanderer. The picture was supplied by Eva Schwarz Lilienfeld and the identifications were made by the team of Eva, Rhoda Moskowitz Leffert and Ruth Abenheim Rosenberg. Scan by Paul A. Waldeck.